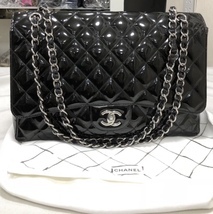 Up for sale is an ULTRA RARE AND ABSOLUTELY STUNNING AUTHENTIC CHANEL PINK QUILTED PATENT LEATHER LARGE MINI RECTANGULAR FLAP BAG WITH SILVERTONE HARDWARE!!! Behold a new creation from Chanel! This adorable Chanel Pink Quilted Patent Leather Classic Large Mini Flap Bag is in a size that amazingly holds your cell phone, keys, and lip gloss. It also features an inside flat pocket and zip pocket that can hold cards or money. The versatile leather and chain straps can be lengthened and worn cross-body, or shortened on the shoulder. Bag is in overall very good condition with minor signs of normal use. Comes with matching authenticity card. GUARANTEED 100% AUTHENTIC. PLEASE PURCHASE WITH CONFIDENCE.